Chris Jack, a native of Salem, N.H., submitted this shot. "This is the Spartans tenor line from 2004. This picture was taken at DCI Division II & III Finals in Denver about five minutes after retreat. "From Left to Right: Our tenor tech Mike "Wuzzy" Wasielewski, Mark DeLacy, me, and Evan Girouard. "I have had some truly great seasons with Spartans since I began marching with them in 2001. From winning high percussion in 2003 to finally winning a championship last year, 2004 was special because I got to march between two of the coolest guys I've ever met. 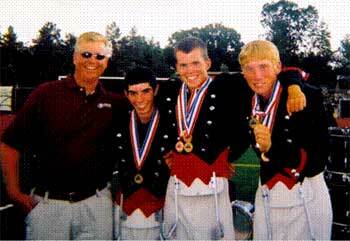 "2005 is the 50th anniversary for the corps and once again I will be marching with Mark and Evan in the tenor line. "It should be another monster season here in New Hampshire!" Thanks Chris!